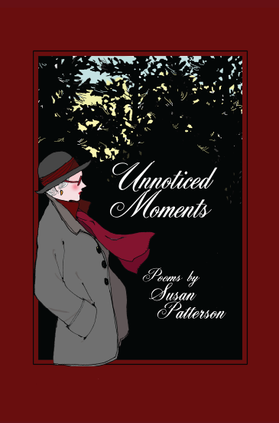 Susan Patterson’s poetry touches the heart in many ways. Her latest book, Passions, is a collection of love poems, some demure, some almost risqué. The reader will find passion in all of them. The best love stories linger long past their moment of ignition. Love, and especially love fueled by passion, is a necessary counter balance to all the rest of the human experience. These poems isolate moments of passion, they remind that whether fleeting or sustained, passion is worth lingering with, believing in, and thinking about, while reading a book of poetry. This perfect bound printed version, available directly from this web site, includes free shipping. For a limited time the price is reduced for the holidays to fuel your passion. "She is a vibrant thread of gold in the lives of so many people around the world. We may never know them all, but we know that Susan’s gems are shining in their lives as brightly as they do in our own." "Susan has the rare knack of constructing simple lines with few words, which contrive to slip under the most careful guard and penetrate our souls and leave their wisdom for us to relish." "When I first heard one of the Earlene Grey Tom and Irma works I was taken aback; how could such a short work be so effective and draw such strong feelings from me. As each work followed with its laughter and tears I realised that the magic of these works is the same as in her tea poems. Knowing what she wants to say and then compressing it in the minimal number of words. I feel that the poems were the parents of the T&I works; it may not have been possible one without other. May Ms. Grey know our on going joy and delight at all her works, may they both march on side by side for a long time to come to give us continued pleasure." "Heart to Heart is a lovely reminder that our most precious times are often found in the humble moments of everyday life. Settle in your favorite chair, with a cup of tea, and allow Earlene to guide you back to the glorious grace of calm and quiet." "She is one of those rare and admirable people who have found a way to create a path where no one has gone before. Somehow people have respected that, and she has her niche to herself still. Of course, that probably has to do with her own gifts… her poetry is so clever and you can enjoy it at so many levels. Everyone seems to be able to relate… and when she reads or quotes it, it adds even more dimension." "Earlene’s words eloquently express the heartfelt sentiments we all share when we come together for tea. A beautiful gift book." "I am speechless! Stunning work." "I found your tea musings to be sublimely eloquent and elegantly philosophical. Thank you, thank you, and thank you!!!"